Degree students in the Netherlands may soon have more opportunity to study for their courses overseas. 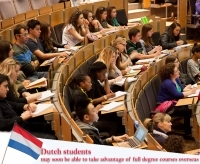 Under current legislation, Dutch students must study at least one quarter of their degree course in the Netherlands. However, after much political debate, a bill has been passed with which open up opportunities in international education. The bill issued by The Dutch House Of Representatives, will hopefully be passed by the senate in the summer. Changes in the regulations will come as a welcome relief to many students who are undertaking joint or double degree programs, as they currently incur fees from both the Dutch institution and the overseas counterpart. The new bills would mean fees are only payable to the educational establishment in the Netherlands. The education minister, Jet Bussemaker gave her support to the move. She stated that the change in rules would give Dutch educational institutes more recognition on a global level. She went on to say that overseas campuses would promote the visibility of the Netherland’s higher education systems. Currently there are over 240 Dutch institutions offering degree studies overseas, but only one actual campus. The new legislation is expected to see that change and encourage more joint study programs. Indeed the University of Groningen is already planning a campus in China, once it receives government approval. During the discussion at The Dutch House Of Representatives, it was apparent that any opportunities for students to study for degrees overseas must have significant benefits for example, will the student gain better social or education value? Will they have better communications with teachers? Furthermore, public money will not be used to establish overseas campuses and only degrees which are already taught within the Netherlands will be available.